A call to Ocean Independence confirms a €1,050,000 price reduction on Eric Trupheme's listing, the 47.5m motor yacht Olah. Designed by Walter Franchini, Olah was built to Lloyds class at ISA in 2005 and was recently refitted in 2011/2012. A popular charter yacht, she has ample deck spaces and a light, elegant interior accommodating 10 guests in five staterooms. Twin 2333hp MTU engines give her a range of 4,000 nautical miles at 12 knots. 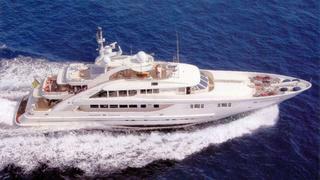 Down from €16 million to €14.95 million, Olah is lying in Golfe Juan where her 50m berth is also for sale.